Yoga has never been more popular. Throughout the United States, people are turning to this ancient practice as a response to the pressures of today's hectic world. 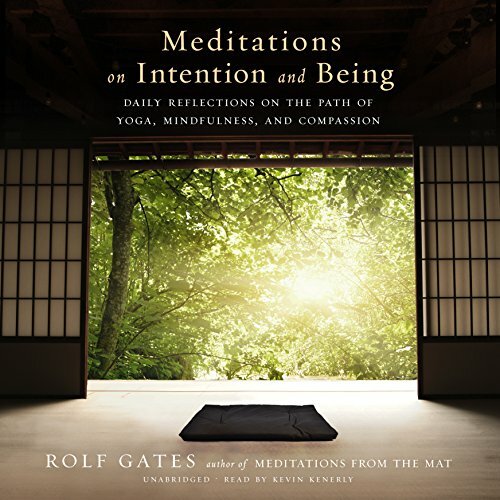 In Meditations on Intention and Being, acclaimed yoga teacher Rolf Gates draws on 20 years of teaching experience to explore and explain how to take the mindfulness of yoga off the mat and integrate it into every aspect of life. Presented in the form of 365 inspirational daily reflections, Gates helps listeners - from experienced yogis to novices seeking a little tranquility - to fundamentally reconsider their relationships with their minds, their bodies, and the universe around them through self-reflection. Over the course of seven chapters, he explores effortlessness, nonviolence, the spirit of practice, mindfulness, compassion and loving-kindness, equanimity and joy, and intention and being, giving listeners the tools they need to effect positive changes in their lives.